The future looks bright for the La Salle University baseball program entering the 2019 season as second-year head coach David Miller has recruited an outstanding class of freshman and transfers to the campus on Olney Avenue. The class, which includes 13 incoming freshmen and four transfers, was ranked No. 1 among Atlantic 10 Conference teams and 73rd in the nation by Perfect Game. "We are very excited about our first recruiting class as a whole," said Miller. "We targeted specific needs and specific players, and everyone seemed to share our vision as we build La Salle baseball for the future. We couldn't be happier with where this program is heading and expect big things to come." Among the new recruits sits freshman hurler Chuck Kelley. 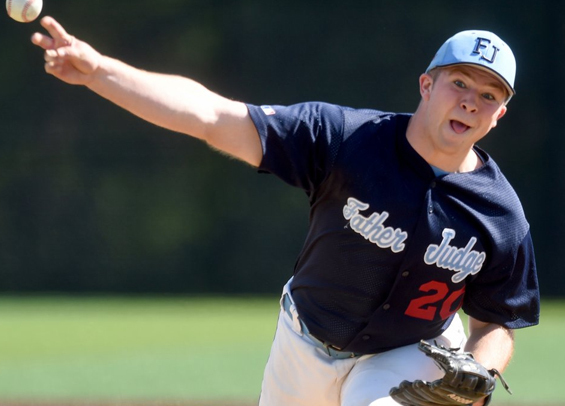 The six-foot, 210-pound right-hander starred at Father Judge, finishing 5-1 with a 0.78 ERA and 61 strikeouts in 44 2/3 innings for the Crusaders last season. He also won Philadelphia Catholic League Most Valuable Player honors. Offensively, the Explorers added a potential power bat in catcher Tatem Levins. The Langhorne, Pa. native starred at Notre Dame High School and hit .461 with 31 RBI's and 15 extra-base hits in the spring. He also showed some pop in the Atlantic Collegiate Baseball League this past summer, hitting six homers to go with a .342 average. The Explorers had a rough go of things last season, finishing last in the Atlantic 10 with a 14-41 (4-20) record while ending the year riding a 16-game losing streak. That all looks to change come February.